Years of experience are showing through in the work of Craig Padilla. His many concerts and collaborations with Skip Murphy have paid off in the form of a nuanced and mature work. This duo are realizing pieces that sound modern yet come across as strong as classics 20 or 30 years old. 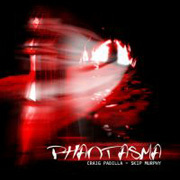 Phantasma (71'46") casts a dreamy electronic mood as it undercuts technology with an unexpected air of tenderness and sensuality. Its sense of drama comes not from manic leads, drop ins and quick cut key changes, but rather from the gradually increasing complexity of sequencer pattern runs. From rhythms slow, sparse and open to churning machine-like synchronization, Padilla + Murphy masterfully create a wonderful momentum. By systematically adding notes to fill out layers of cycling phrases against the motion of synthesized chords and pads, they build up, fill out and connect each of their six pieces into a well-integrated and vital sound picture. From benign daydreams and apparitions to cosmic visions and revelations, Padilla + Murphy work within the infinity of cerebral excitation.